Highly Reactive Polyisobutylene (HR-PIB) Market size was more than USD 200 million in 2016 and will witness 4.7% growth during the forecast span. Product finds major application in the construction industry as adhesives & sealants owing to its tackiness and stability which makes it ideal for various hot melt pressure sensitive adhesives. Additionally, moisture resistance, high degree of elongation and good adhesion properties to multiple substrates make it useful for sealants. The construction industry in the Middle East is likely to grow at a CAGR of over 7% which in turn will boost highly reactive polyisobutylene market size in the coming years. This is due to wide-ranging product use in adhesives and sealants in various forms for damp proofing and roof repair. For instance, adhesives are used in flooring, insulation, panel, partitions and roofing, while sealants are used in facades, fire protection and IG units, among others.Strong product demand across automotive industry primarily in Asia Pacific has propelled highly reactive polyisobutylene market size in the recent years. This is majorly attributed to increasing population along with rising socio-economic factors in the region which has been driving automotive industry and subsequently driving demand for tire & tubes industry. Product finds application in manufacturing inner liners of tires owing to its impermeable nature. It is also used to manufacture tubeless tires which are more durable and requires less maintenance. On an average, HR-PIB accounts for 15% of the total rubber content in a tire which also varies depending on the vehicle. For instance, the rubber content in a car tire varies from 3.7 kg/tire in Japan to 5.0 kg/tire in the U.S. and Germany. For commercial vehicles (CV), it varies from 9.24 kg/tire in Japan to 24.28 kg/tire in the U.K. These trends are likely to make a substantial impact on the overall highly reactive polyisobutylene market size during the forecast period. Rising environmental concerns which is attributed to stringent legislations formed by regulatory bodies and regional government is likely to impede highly reactive polyisobutylene market size over the projected timeframe. For instance, product is used as a lubricant in ship engines contaminated water leading to polluting water bodies which affects aquatic life by causing death and genetic alteration in the long run. However, strong demand from automotive, construction, etc. industry will generate plentiful opportunities for highly reactive polyisobutylene market size in the near future. Low molecular weight for highly reactive polyisobutylene market size attained the highest industry share and is anticipated to grow at a CAGR close to 4.5% in the near future. This is majorly due to its primary application is as a reactionary intermediate such as lubricant additive manufacturing. Low molecular weight HR-PIB viscosity is approximately 225 mm2/s at 100°C. Additionally, it possesses various other value-added advantage including less char production during manufacturing and ability to improve final lubricant and fuel performance. 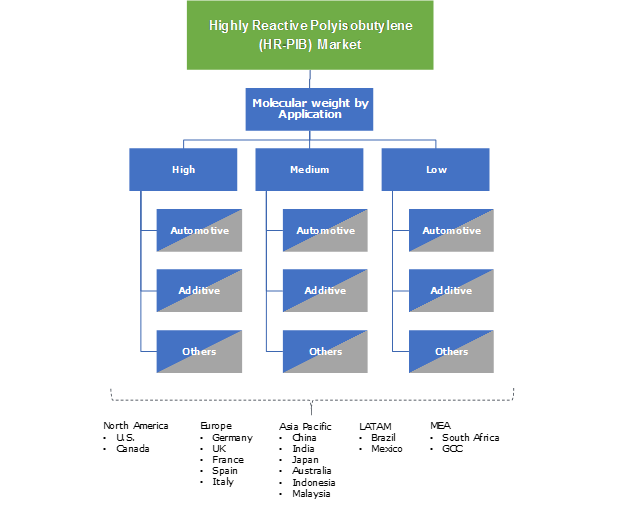 Highly reactive polyisobutylene market size for additive is anticipated to grow at a CAGR close to 5% in the coming years. This is chiefly due to product’s detergent properties which reduces hydrocarbon and particulate emission when added to fuel. Rising need for lower emission fuels is likely to further augment product demand which in turn will help attain promising gains to highly reactive polyisobutylene market size in the coming years. It is added in small amount to lubricating oils to help reduce oil mist generation and offer improved final product performance to the consumer and better manufacturing economics for the additive supplier. North America highly reactive polyisobutylene market size is projected to grow at a CAGR of over 4.5% during the forecast period. This is majorly due to strong growth in the automotive, construction and medical packaging industry. Product possess excellent features including chemical resistance and low permeability to air, moisture and gases. Henceforth, it is preferred in manufacturing a range of medical packaging applications such as serum vials, injectables, saline bottles and seals which will make noteworthy contribution to highly reactive polyisobutylene market size over the projected timespan. Product’s impermeable nature makes it preferable for manufacturing tubeless tires in automotive industry. However, product is majorly used as a fuel and lubricant additive to improve the overall performance owing to its highly reactive nature compared to conventional polyisobutylene which will make significant contribution to highly reactive polyisobutylene market size in the coming years. Major highly reactive polyisobutylene market share contributors are TPC Group, RB Products, Inc., BASF SE, PETRONAS, Janex, Lanxess, Kothari Petrochemicals and Mayzo. Other HR-PIB players include Jinzhou Snda Chemical, Ningbo Hi-Tech Biochemicals, Shanghai Minglan Chemical, Jinzhou Snda Chemical, Weifang Binhai Petro-chem and Shandong Hongrui New Material Technology. Most of these players have been engaged in expanding its production capacity to meet rapidly rising consumer demand and to attain competitive advantage. For instance, TPC Group announced capacity expansion of polyisobutylene unit in February 2015. It was intended to strengthen their position in North America. Highly reactive polyisobutylene is comparatively more reactive than conventional polyisobutylene due to the position of double bonds in the terminal position of the molecule which make it to react more quickly specially as fuel and lubricant additive. It is a commercial polymer which possesses thermal stability, good flexibility and impermeability to gases. In addition, it has high resistance to acids, alkalis and salts. It is majorly used in the manufacture of inner tubes of tires, adhesives, sealants in construction industry, serum vials, injectables, saline bottles, seals for medical packaging and chewing gum among others. 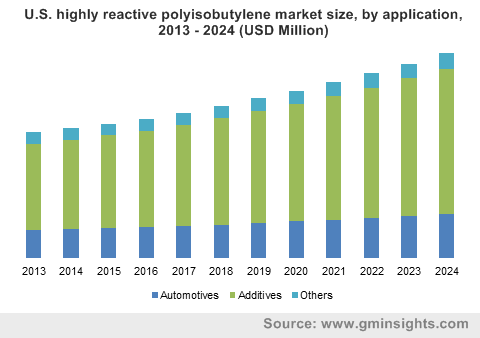 Rapidly growing automotive industry due to amplified consumer spending power in Asia Pacific is a major factor contributing to highly reactive polyisobutylene market size during the forecast period. Additionally, growing construction industry in Asia Pacific and MEA is another factor likely to make significant contribution to the industry share owing to its wide-ranging applications as adhesives and sealants which will drive highly reactive polyisobutylene market size by 2024.